Solomon Asuquo is 26, he is an author, social entrepreneur and dynamic inspirational speaker. He studied Accounting in Lagos State Polytechnic, Ikorodu. Lagos Nigeria. He is passionate about helping underprivileged children, and youth in maximizing their potential. 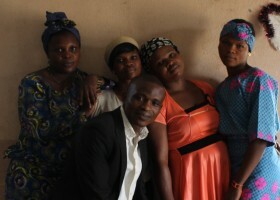 He has initiated several mind empowerment projects for children & youth in Nigeria. He is a certified YALI Network member(Young African Leadership Initiative a Network founded by the US Government to engage African Youth), A participant of the 2015 World Bank Group MOOC training on Financing for Development 2016-2030 and 2016 World Bank Group MOOC training on Citizen Engagement with certificates of Accomplishment. He is the Co – Founder of Girls Empowerment Network Nigeria, a platform that champion the cause of vulnerable and marginalized Young Women and Girls in Nigeria. The platform connect vulnerable young Nigerians to opportunities in the area of Education program, Youth and Women Empowerment program, Policy Advocacy on Gender Equality, Climate Action, Girls Education, Sexual, Reproductive Health and Rights so as to contribute to the actualization of the 17 SDGs (Sustainable Development Goals) the global agenda 2016 -2030.